A 5 day school and retreat with inspiring and impacting teaching by Ray Hughes, Stephen Roach and guest appearance by Martin Neil. There will be sessions for practical skills and plenty of time for creative worship. This school is aimed at those who are already stepping out in their creative gift - worship leaders, designers, craftspeople, artists, session musicians, singer songwriters, authors, creative entrepreneurs etc. Ray Hughes - A hugely respected Father of the Faith, teacher and story teller. Ray is a clear, prophetic voice, singer-songwriter and revival historian. Stephen Roach - Multi-instrumentalist, poet, author and teacher. A founding member of folk band Songs of Water and pioneering visionary of The Breath and the Clay conference and Mystics and Makers podcasts. Martin Neil - Percussionist and drummer with Kevin Prosch and founder of Voices from the Nations. Martin has wonderfully inspiring stories to tell about his travels and experiences with other cultures. He has worked with hundreds of professional musicians and played on Stephen Roach's first album. The school is at Lox Lane Farm, Dorset. It starts with Dinner on Easter Monday (2nd April) and runs through to lunch on Friday 6th April. You can arrive on site from 5pm, dinner is at 6pm. There will be worship and an introductory session on the Monday evening, with 3 sessions a day on Tuesday, Wednesday and Thursday. On Friday morning, we will have a session of impartation and commissioning. All meals are provided during the school, with unlimited tea and coffee throughout the day. All rooms are en-suite, with double or twin beds, so either bring a friend or be prepared to share with a new one! Students staying on site, must be 18 or over, but non-residential students can be 16+. This particular school is not suitable for children and there are no childcare facilities. (If you want to attend our events as a family, please come to our Conference on 30th and 31st March 2018). There will be an opportunity to bless Ray, Stephen & Martin, when we take up an offering, towards the end of the School. £300 non-residential, Mon 6pm - Friday 2:30pm. Includes lunch and dinner, unlimited tea and coffee. £365 residential, Mon 5pm - Friday 2:30pm. For those staying with their spouse or a friend, new or old. Includes en-suite room, breakfast, lunch and dinner, unlimited tea and coffee. Twin room or double, to be shared. £410 residential, sole occupancy. For those who prefer time alone. Mon 5pm - Friday 2:30pm. Includes en-suite room, breakfast, lunch and dinner, unlimited tea and coffee. Own bedroom. Lox Lane is easy to reach by road and rail, being close to the A303 and on the Waterloo line from London to Gillingham Railway Station. You will then be sent an application form by return. We can't wait to hear from you!.. Come and join us for our 6th Created to Worship weekend Conference! 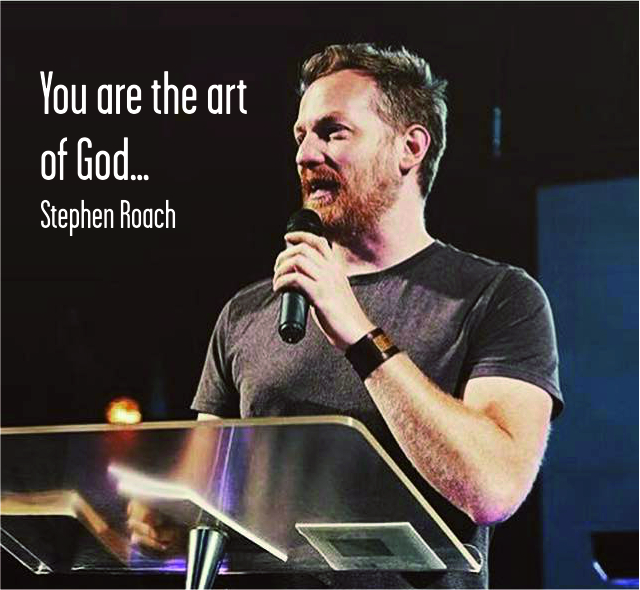 We are greatly honoured to be joined once again by Ray Hughes and we're looking forward to welcoming a new face to the CtW family, Stephen Roach, both of whom will be teaching, inspiring and encouraging us over the 2 day event. Stephen Roach is a multi-instrumentalist, songwriter, public-speaker, author, and poet. He is the founding member of the cinematic-folk band Songs of Water and pioneering visionary of The Breath & the Clay creative arts movement. Stephen has written and recorded six albums and contributed music to independent films and commercials as well as the works of recording artists Ricky Skaggs, Jonathan David Helser, John Mark McMillan, and many others. As always, there will be an afternoon filled with a variety of practical workshops, so you can try a new craft or develop existing skills. This year, this includes teaching on dream interpretation, as well as some practical writing and artistic workshops. In the past, these have ranged from using Ableton, creating art on an ipad, creating animated films using lego, to learning crochet, sculpture or dance. We have yet to confirm the line up for this event, but we can assure you it'll be varied and fun! We will also be offering prophetic ministry and prayer for healing, at various times throughout the conference. Sessions can be booked on the day. Your children are very welcome, but be aware that there will not be any crèches or childcare at this event. There will be space for them to express their worship during our 'corporate worship' times, and we hope they inspire us adults, with their dance, drawing and journaling! However, as the teaching sessions will be recorded, we may ask you to take them to another room to play, if they are making a noise during the talky bits! Technical workshops are suitable for children ages 11 and above and artistic/craft workshops from age 8. There will be an opportunity to bless Ray and Stephen, as we will be taking an offering on both days. We are delighted to welcome Ray Hughes and Austin Biel to teach at this residential worship school, set in the heart of the beautiful Dorset countryside. The School is aimed at Pastors, Worship Pastors, Worship Leaders and Musicians, Professional Artists/Musicians/Songwriters/Creatives, and those who teach and lead others in these areas. Ray will inspire us with Biblical truth and revelation of God's Word as we explore the reality of our creative identity and how we can develop what God has put in each of us. He will help us to rediscover the wonder of our Creator and how we can boldly step into our place as His children. Following on from our school in 2016, Austin will return to encourage us, through practical sessions, with how to be confident to experiment and play with our creative gifts. There will be sessions of "all skate" where we each get involved with instruments, voice and visual arts, and others where there is more 'forum style' question and answer teaching. The school is at Lox Lane Farm, Dorset. It starts with Dinner on Easter Monday (17th April) and runs through to lunch on Friday 21st April. You can arrive on site from 5pm, dinner is at 6pm. There will be worship and an introductory session on the Monday evening, with 3 sessions a day on Tuesday, Wednesday and Thursday. On Friday morning, we will have a session of impartation and commissioning. Students staying on site, must be 18 or over, but non-residential students can be 16+. This particular school is not suitable for children and there are no childcare facilities. (If you want to attend our events as a family, please come to our Conference on 14th and 15th April 2017). There will be an opportunity to bless Ray and Austin, when we take up an offering, towards the end of the School. Come and join us for our 5th Created to Worship weekend Conference! We are greatly honoured to be joined by Ray Hughes and Austin Biel, who will be teaching, inspiring and encouraging us over the 2 day event. It's our pleasure to welcome Austin back to the CtW fold. Following on from last year's teaching, Austin will be challenging us to step out and explore what it means to truly discover your creative identity. Austin will run practical sessions as well as seminars, so you can practice what he preaches! As always, there will be an afternoon filled with a variety of practical workshops, so you can try a new craft or develop existing skills. In the past, these have ranged from using Ableton, creating art on an ipad, creating animated films using lego, to learning crochet, sculpture or dance, and a large number of other options in between. We have yet to confirm the line up for this event, but we can assure you it'll be varied and fun! Your children are very welcome, but be aware that there will not be any crèches or childcare at this event. There will be space for them to express their worship during our 'corporate worship' times, and we hope they inspire us adults, with their dance, drawing and journaling! However, as the teaching sessions will be recorded, we may ask you to take them to another room to play, if they are making a lot of noise during the talky bits! Technical workshops are suitable for children ages 11 and above and artistic/craft workshops from age 8. There will be an opportunity to bless Ray and Austin, as we will be taking an offering on both days.